Be the first to share your favorite memory, photo or story of Alvin . This memorial page is dedicated for family, friends and future generations to celebrate the life of their loved one. Elder Alvin Leon Saunders, son of the late Cornelia Anderson Saunders and the late Nathaniel Saunders, professed hope in Christ and was baptized at an early age. He joined Pentecostal United Holy Church under the leadership of Elder Mckinnley Martin. Elder Saunders attended Marantha Bible Institute to continue his journey to become a minister. Elder Saunders was a member of the Minister’s Alliance of Danville VA and a member of the Virginia Piedmont District Association and Western NC Association. Elder Saunders used his gifts and talents that God gave him to minister to others for over 35 years and became the Lead Pastor at Pentecostal United Holy Church. 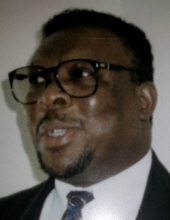 Later Elder Saunders became Pastor of James Street United Holiness Church; Associate Pastor at Mt. Zion United Holiness Church under the leadership of Elder James Hagwood, Associate Minister at Evangel Temple United Holy Church, Pastor at Disciples of Christ United Holiness Church until his decline in health. Elder Saunders put God first and family second at all times. Elder Saunders leaves to mourn his beautiful wife and “sweetheart” of 55 beautiful years Betty B. Saunders. To their union he leaves six children to mourn Tim Saunders (Teresa), Michelle Greear (Darvin), Mark Saunders (Camilla), Karen Jones, Tiawanda Calloway (Anthony) and Nashunta Crews (Rodney). He was preceded in death by one son Reginald D. Saunders. Elder Saunders leaves to mourn two sisters; Yvonne Owens (Marvin) and Shirley Dixon. He was preceded in death by three sisters Mary Luck, Betty Mae Swann, Marie Edwards and two brothers Nathaniel Saunders and Andrew Saunders. Elder Saunders leaves to mourn a host of grandchildren, great grandchildren, brother-in-law’s, sister-in-law’s, nieces, nephews and other relatives. The family will receive friends Friday, March 29, 2019, from 6 p.m. to 8 p.m. at Norris Mt. Hermon Chapel, 3995 Franklin Tpke., Danville, Va.
Funeral services will be held at 2 p.m. Saturday, March 30, 2018, at Norris Mt. Hermon Chapel with James Royster, Presiding Pastor, and Rev. Earnest Barksdale, Eulogist. Interment will follow at Highland Burial Park, Danville. Norris Funeral Services, Inc. & Crematory, Mt. Hermon Chapel, 3995 Franklin Tpke., Danville, Va. is respectfully serving the Saunders family. Online condolences may be made at www.norrisfuneral.com. To send flowers or a remembrance gift to the family of Alvin Leon Saunders, please visit our Tribute Store. "Email Address" would like to share the life celebration of Alvin Leon Saunders. Click on the "link" to go to share a favorite memory or leave a condolence message for the family.